For me, there is nothing more relaxing than getting dressed in my coziest pants and sweater, listen to my music up loud while heading to the craft store, and spending far too long perusing the aisles. But, I rarely have time for that sort of thing anymore. between working and my strong-willed toddler, craft shopping is a to-do item that can sometimes sit for weeks on my list. So, more often than not I end up buying a lot of my supplies online, especially through Amazon Prime. I’ve made a list of some of my favorite purchases, and some items on my wishlist. Have a look below! Brother Sewing Machine – This is one of my favorite things on Amazon. I love to sew, but I love this small sewing machine even more. It’s inexpensive, but has great reviews and I love it. Basic Cricut Set – If you use a circuit a lot like I do, you’ll need this Cricut set. It would be a great stocking stuffer for the crafter in your life or even as a birthday gift. Acrylic Set – If you are a true crafter, you do painting from to time, which is why you need this acrylic set in your life. Silhouette Curio Crafting Machine – It is no secret that I love my Silhouette Cameo. The Curio is just as powerful, but with a more compact size. It fits nicely on any desk, so etching, stippling, and sketching just got a whole lot easier and more fun. Deluxe Craft Paper Trimmer – This trimmer has come in handy so many times. It’s super easy to use and every crafter should have it in their possession. Rechargeable Screwdriver – I love having a set of tools for myself. It comes in handy whenever crafting or doing stuff around the house. This Screwdriver is great for those little DIY projects that require more power. Oh, and it isn’t pink. Women can use regular power tools too! Compact Sewing Kit – If you want to keep things simple in your crafting room, check out this crafting sewing kit. It’s compact and you can take it with you on the go. I like having as much as I can in one place especially if I can keep it from taking up too much space. 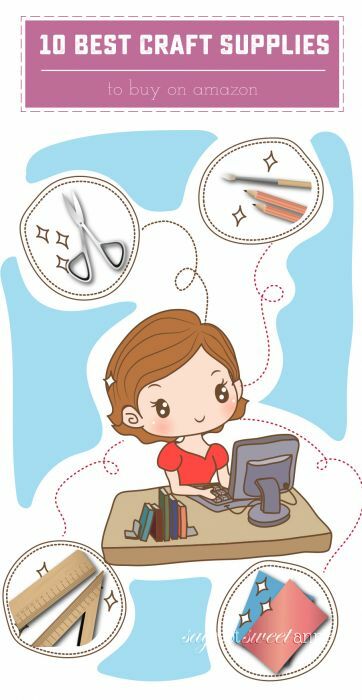 Crafting Scissors – Every crafter needs her own pair of scissors. These are my ultimate favorite go to scissors. Every year I ask for more (because my hubby keeps swiping them) and they never disappoint. This two pack is perfect for stashing one away in a secret place. Detail Paint Brushes – Whether or not you love to paint (and I do not) paint brushes are essential for the craft room. From fine glued details, applying varnishes or dry brushing glitter, even actually painting! There you have it, the best crafting tools on Amazon. Whether you love crafting or know someone that loves crafting, you need to grab these tools from Amazon. I can’t tell you how often I use these items daily. What are your favorite crafting tool to use? Where did you get it? Share with us in the comments section.